(May 25th, 2012) What do a non-profit dedicated to encouraging savings among low income earners, an industry group focused on preventing the government from going completely paperless, and two financial information websites have in common? They are all opposed the elimination of paper savings bonds. 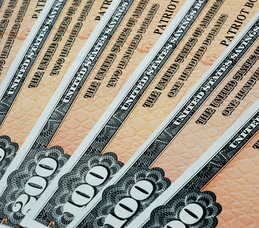 As of January 1st, 2012, the US Treasury Department ended the sale of paper savings bonds. There was no public hearing or debate. This was a unilateral action by the Treasury Department made without any large-scale effort to obtain feedback from the general public. Since then the public has responded. As of May 24th 2012, the Bring Back Paper Savings Bonds Petition has, collected almost 4000 signatures. We respectfully ask the Treasury Department to bring back paper US Savings Bonds and restore this American Tradition. We believe that the Treasury Department’s actions to end the ability to buy paper savings bonds on January 1st, 2012 was a mistake. With your help, this mistake can be reversed. The petition effort was started by bond education site Learn Bonds in the beginning of the year, and quickly joined by SavingsBonds.com. SavingsBonds.com turbo-charged the petition effort by launching the Bring Back Paper Savings Bonds website, and launching an e-mail marketing effort. Those interested in supporting the petition can sign the petition at the Bring Back Paper Savings Bonds website. Bring back the paper savings bonds. Many of us middle age citizens do not trust ourselves —purchasing ssavings bonds on line. Small children want a “present” to unwrap—when they receive savings bonds–parents will keep the savings bonds in a safe place for the children. is o.k., you don’t have paper bonds anymore………..i don’t buy them anymore……….simple solution. Paper bonds are a great way to save small increments and register an emotionally charged sense of accomplishment when being able to review ones savings portfolio at home. It is a similar feeling of holding cash in hand. Digits on a screen do not have the same effect. I wanted to purchase bonds for my grandchildren, as my grandparents did for me. By the time I was ready to purchase a home, the bonds were enough to provide a good down payment. It is unfortunate that I will not be able to make that purchase. I refuse to do business on the Internet. My information is not safe there. We know this by the many breaches that have occurred on sites, including US government sites, that the public has been assured were secure. Bring back the paper bond. I want to hand the grandkids a gift, not have them look online at a public computer (they do not have computers at home) further risking my personal information. I’d rather have paper bonds. I am so terribly disappointed that we can’t buy Paper Savings Bonds anymore. What an awful decision to stop that practice. It should be reversed! Don’t know who has benefited but everyone has lost by eliminating Paper Savings Bonds. Bring back paper bonds. I do not like using computers and having so many passwords that I can’t remember. There is too much room for errors on computer. I loved buying paper saving bonds. Please please bring them back!!!! was to repeat my purchase of a paper bond for a nephew graduate , but cant do that now. I could send an electronic version but the govt wants the recipient’s SSN# // using a SSN# for an identifier use to be illegal !! its just not worth it anymore… who made the paperless decision? — CEO of Sears Roebuck !!!? Really sad that American families can no longer follow the tradition of buying bonds for our grandkids, nieces and nephews. Everyone felt as though they were doing a small part to help a child’s future. The kids loved getting them! Shameful that this ended, without our input.